West Ham United felt the wrath of Liverpool’s front three at Anfield as the hosts romped to a 4-1 win to climb up to second in the league table. Going into the game, Liverpool were heavy favourites to win as they’ve been in sparkling form of late. 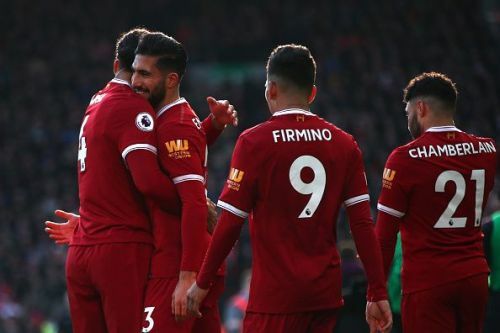 Goals from Emre Can, Mohamed Salah and Roberto Firmino put the Reds in a commanding position before Michail Antonio managed to pull one back. The hosts never stopped attacking, though, and added a fourth when Sadio Mane tapped in from a close range. The midseason training camp at Marbella was a much-needed break the side needed, but it seems the break had the biggest impact on Emre Can. The German played at the centre of the park and was almost unstoppable on the afternoon. Early on, Liverpool seemed a bit sluggish when in possession as the passes were a bit slow and that allowed West Ham the time to get back in shape. But as the game went on, Can began to use his passing and driving ability from the midfield to good effect. His passes to pick out the wingers were sublime and he also put in a shift off the ball, having recorded three tackles in the game. Can opened the scoring with a header from a Mo Salah corner and his sublime pass found Firmino who rounded the keeper to make it three. It’s about time Liverpool tie Can down a new contract as time is running out.